A pair of French Louis XVI gilt bronze candlesticks of exceptional quality. They have been verified as one of a handful in existence after the model by Etienne Martincourt. There are traces to the base of each of a wax seal, suggesting they were part of an important collection. . .
Provenance: Private Collection. . .
Measure: 31cm tall. . .
Scholars know little about the life of Étienne Martincourt. Like many other bronze casters, he worked on the Right Bank of Paris, north of the Louvre, in a quarter that had been home to many bronze workers since the Middle Ages. After becoming a master in 1762, he was admitted to the Académie de Saint-Luc, a guild of decorative painters and sculptors. Membership in the guild of bronze casters and the Académie allowed Martincourt to design as well as to produce objects in gilt bronze. To do so without this dual membership would have brought stiff penalties from the guilds. His work is to be found in museums and private collections throughout the world. There are modern bespoke chandeliers everywhere comprising bits of wire hung with rock crystal at extraordinary prices. We have this fine chandelier in stock which has something quite magical about it. 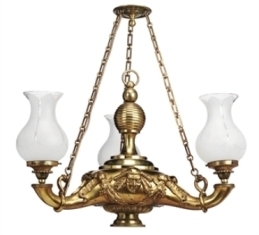 A fine Russian chandelier comprising a mercury gilded bronze Neo-Classical frame which has been hand burnished. It is hung throughout with hand cut rock crystal. Comprising a central stem with different plaques, pendants and stars. The ball finial of solid rock crystal is contained within a gilt bronze cage which is a peculiarity of chandeliers found in St Petersburg. The central stem, ball, stars and some plaques are original and those that were missing have been replaced with new drops. . . Measures: 112cm high x 84cm wide. . . The ball has a diameter of 18cm and the largest plaque is 18cm. . . Note: The chandelier weighs 85 kilos. . .
A large pair of English Regency, six light cut glass & gilt bronze chandeliers, with acanthus decoration, pineapple-cut glass dish and hand blown, etched storm shades. . .
Have not yet been electrified. . .
19th Century & later. . .
After two years, I have only just begun to get my act together and photograph the extensive collection of glassware that I have. Glass has been a personal passion for many years and a lot of it is in fact at home. Over the next couple of weeks I hope to have a lot of it photographed for the website. You can find it under ‘Glass, Silver, Porcelain & Jewellery’. This month I would like to emphasise items already sold (within a day of purchase!) because of their current appeal and also because it may be possible to source them again. This classic Ico Parisi sofa with matching armchairs has become synonymous with 50’s Italian chic. Its clean curved futuristic appearance back in the 50’s was a must have item in any contemporary interior with integrity. There were slight variations on this model, including a clam shell like design and the famous asymmetric model. This sofa and chairs are the most simplistic in design, with clean, bold curved lines. They were very robustly made and the angular brass legs allowed the item of furniture to almost ‘float’ delicately above ground. If you are interested in this model, then do contact me and I may be able to source them for you. Born in Palermo, Ico Parisi at first started out as a painter, working mainly in abstract and worked with Radice, Rho & Badiali. He graduated in construction in Como 1936 and his first job was in the office of Giuseppe Terragni before being abruptly interrupted by the Second World War. After the war in 1948, he returned to Como with his wife Luisa Aiani and they start working together on interior and furniture design. They quickly find themselves designing for for companies such as Cassina, MIM, Singer, Altamira, Longhi & Cappellini. In 1950 Ico graduated in architecture at Lausanne University, quickly going on to exhibit at the “34th Salon des Artistes Décorateurs” in Paris. Notable commissions which followed included the furniture designs for the “Library of the State” Milan 1947 and stands for the “Exhibition of Journalism” Milan 1947, “The Fair of Bergamo” Bergamo 1950, “Carcano House” Maslianico 1949, the “Chamber of Commerce, Industry and Agricoltura” Sondrio 1953 & the “Pavilion Lounge” for the X Triennale in Milan 1954. During this period in the 1950’s, Ico forms close collaborations with L. Fontana, F. Somaini, B. Munari & M. Root . During the 1960’s, significant projects included designs for the ‘Hotel Corte dei Butteri” , The Church “Santa Maria dell’Osa” Fonteblanda Grosseto 1962, “Casa Orlandi” Erba 1966, “Casa Fontana” 1968, “Casa Vivere Insieme” and “House Living Together” Montorfano 1969. In the same year he organises and takes part in a significant exhibition in Como entitled “Campo Urbano”. During the 1970’s and 80’s, his designs for furniture and architectural schemes featured heavily in various exhibitions, including the Venice Biennale 1976 & 78, the Galleria Nazionale d’Arte Moderna di Roma 1979, “achieved Utopia” at the Palazzo delle Prigioni Vecchie of Venice 1978, “Apocalypse Gentile” Rome 1979, The Museo d’Ixelles, Brussels 1980, the Palazzo dei Diamanti di Ferrara 1981, “Les Join Urban Documenta” Kassel 1982, “Les annèes 50” presso il Centre Pompidou Paris 1988. Finally in 1984, there were two exhibitions showing a retrospective of his work over the past forty years at the Italian Cultural Institute in Paris and at the Center ADP in Lille. In 1986 the first exhibition dedicated to him was held at the Padiglione d’Arte Contemporanea di Milano entitled “Ico Parisi: Workshop of the possible”, followed by “Ico Parisi: & Architecture” 1990, “Ico Parisi: & Drawings” 1994 all held at the Galleria Civica di Modena, Milan, which now hold all of his donated archive and drawings. This month I would like to highlight this unusual chandelier. It was rescued from the neo- Byzantine Victorian chapel in what was the Chelsea barracks here in London. The chapel is the only surviving original part of the old Barracks, along with some railings. The remaining 60’s barracks were recently demolished as part of the controversial Candy & Candy development of the site. There is a huge question mark over whether the chapel will survive, as it does not have listed status, which makes this chandelier quite special. This chandelier is unusual in that firstly it was for oil and gas and now has been converted to electricity and more so in that it is of North American manufacture. How it ended up in the back of the Chelsea barracks chapel is uncertain, but it was probably the gift of an American family. It dates to the mid 19th Century and takes its influence from the Regency colza chandeliers in England during the late 18th and early 19th Centuries. It depicts on all three sides a mask of a native American face, which stylistically mimics the classical faces often found on European Colza lights. 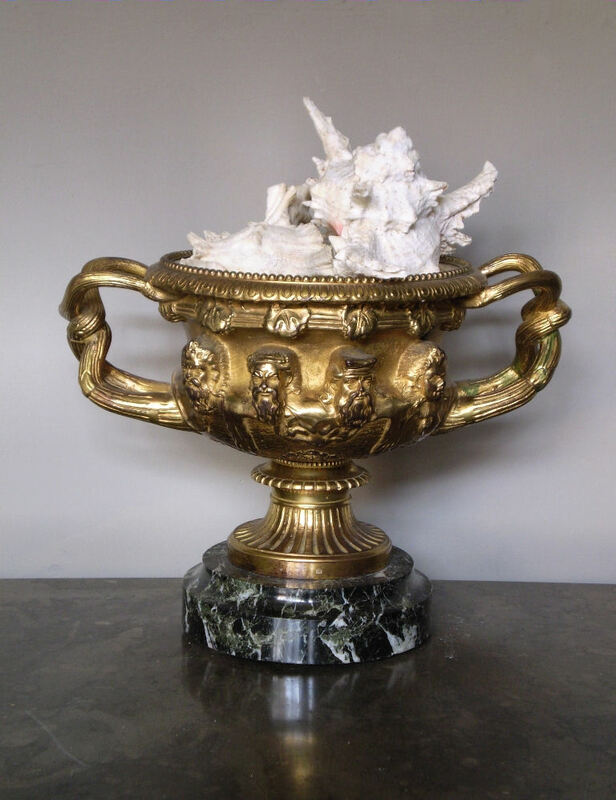 New in is an English model of the Warwick vase in gilt bronze on an antico verdi marble base and a silver liner. It measures: 23cm high x 30cm wide and dates to around c.1840. The name of the Warwick Vase is something of a misnomer, in that, strictly speaking, it’s neither from Warwick, nor is it a vase. Originally made for the Roman Emperor Hadrian, it was excavated in 1769/70 – in numerous fragments – from the site of Hadrian’s Villa at Tivoli, near Rome. The excavator was Scottish painter Gavin Hamilton, who had turned to dealing in antiquities to supplement his income as an artist. Hamilton sold the fragments to his namesake, Sir William Hamilton, the British ambassador in Naples, who had it reconstructed at great expense to the designs of the celebrated engraver and architect Giovanni Battista Piranesi (the work took more than two years). 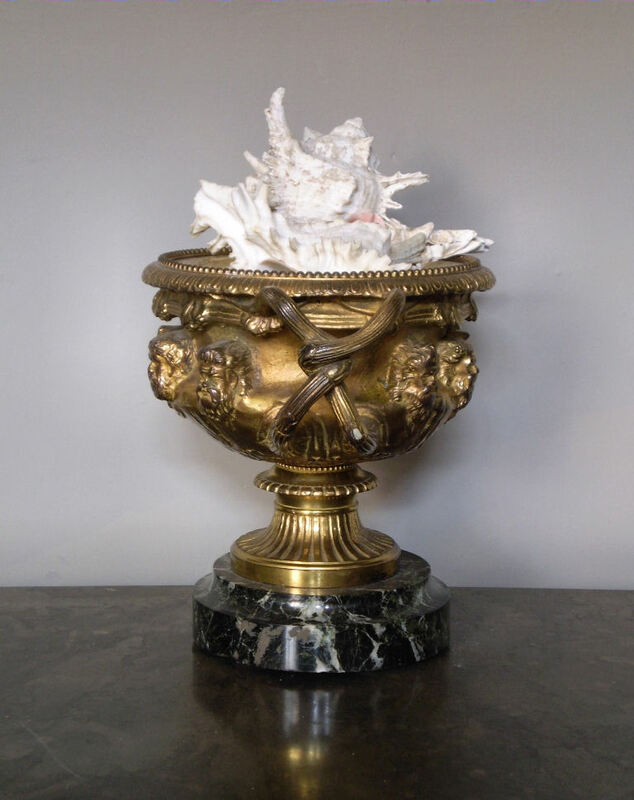 The Warwick Vase – named after the Earl of Warwick, who eventually bought it – became one of the most coveted objects in Europe. 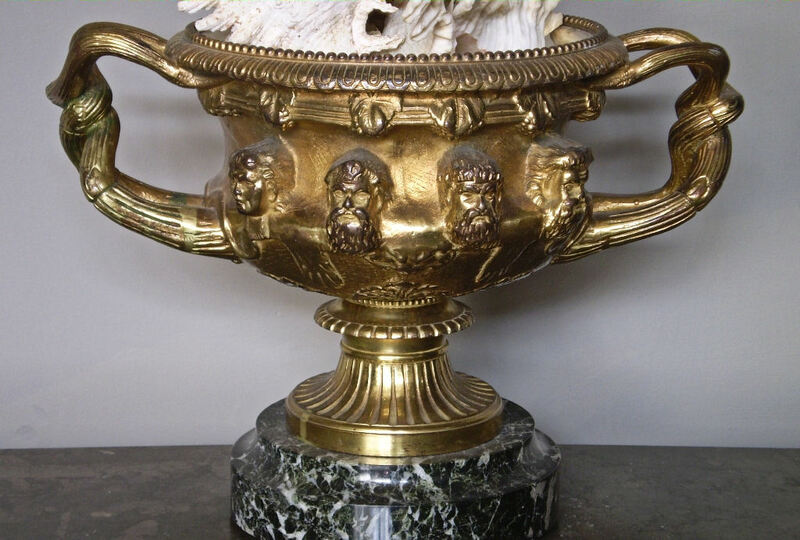 Indeed, when Napoleon was planning his conquest of Britain, he declared that the first thing he wanted to get his hands on was the Warwick Vase. Standing at ten feet tall, and weighing more than eight tonnes, the Warwick Vase is rather larger than your average receptacle for cut flowers. It was bought by the Burrell Collection in 1979, and now stands in the middle of the museum’s internal courtyard, where it shares space with sculptures such as Rodin’s The Thinker. Its sheer size and presence, however, means that the Warwick Vase always stands out: a relic of Ancient Rome, a towering achievement of marble carving, and the centrepiece of one of the Burrell’s most rewarding spaces. This month I would like to focus of this very unusual chandelier, which has an interesting story attached to it. It was removed from the old chapel in the Chelsea barracks, London, SW1. The chapel is the only building left standing from the original Victorian buildings and has been in the spotlight recently, as the land is currently being redeveloped by the Candy brothers. The chandelier was rescued from the chapel recently and it was thought, that if emergency listed status could not be granted to the chapel, it would have been demolished. The chandelier was reputedly given by an American benefactor, sometime in the early 20th Century. It is made of gilt brass and is of American manufacture, and would originally have been designed as a three light gasolier, later being converted to electricity as with all light fittings of this period. It is unusual in that it is of classical form, but rather than displaying the usual Greek, Roman or Egyptian imagery, this has been substituted with native American faces. It dates to around c.1850-60. 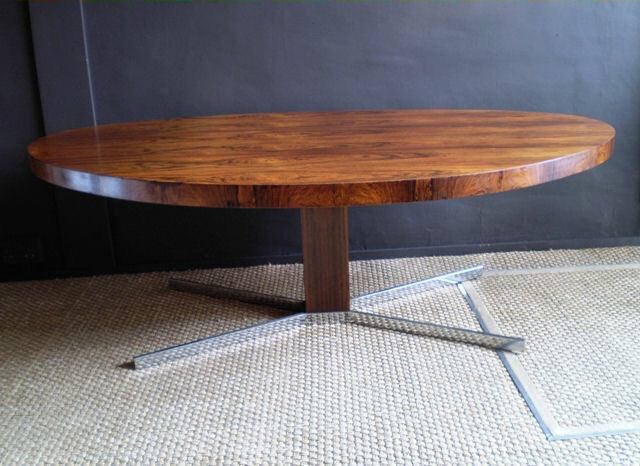 This month, I would like to shine a spotlight on a Merrow & Associates table that we have in stock. It is unusual in that it is on a hydraulic riser in order to adjust the height and is an irregular shape. It has a chrome base and the table itself is rosewood veneered. It dates to around 1968. Merrow Associates was a British engineering company that branched into designing and making sideboards and cabinets in the 1960s. The quality of their work is technically unsurpassed, and so these are very much in demand. The company was started by Richard Young, who is a former Royal College of Art student who later studied at the Royal Art Academy Copenhagen under Professor Old Wansche. Richard Young is obsessed by quality and the kind of meticulous detailing typical of Scandinavian furniture of the 1950s. He uses beautifully finished glossy surfaces – a juxtaposition of rosewood, steel and glass – as substitutes for patina and marquetry. He trained as a cabinet maker, another reason why materials feature high in his design priorities. Distribution was restricted to specialist retailers. Heal`s and Harrods. Although the firms idiom is essentially traditional modern classic (they prefer to call it), Merrow Associates has proved that British workmanship, properly directed, matches Scandinavian.